They were perfect. I was able to decorate my mini skulls. Who likes butterflies?....This girl does!! My name is Jenni and I'm the owner, designer, dinner making, disaster cleaner and frantic delivery driver! I'm pretty sure I couldn't have done it without the help of my family & Mr. Shaky, aka (coffee). I wanted to make a unique paper craft that my customer could incorporate into their finished product! In 2007 that's when I opened The Bungalow Butterfly and started creating paper butterflies! 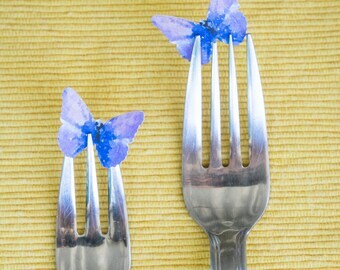 Many of my customers use these butterflies for their DIY weddings, baby showers, cupcake toppers, collage altered art, jewelry, scrapbooking, etc... Over 7 years I have made 200,000 butterflies and counting! It's a love/hate relationship! So far all my butterflies have made it to happy homes and that makes me one happy shop owner! I find time to laugh, hug and *sigh everyday! Creativity comes through life experiences! Embrace it! 😊I'm convo friendly! If you have any questions please let me know. Thanks for supporting handmade! 📦 I ship everything via USPS First Class, with tracking. International shipping please contact me for shipping quote.